In any business, name tags help to build a corporate identity and help employees and customers to interact with one another. Company name badge use seems to have taken a popularity dip recently. However, there are still significant benefits to wearing and using name tags and name badges. Personal identification can be used in marketing a company or business as well as provide security, identification and many other positive benefits. Here are few reasons to utilize name tags and name badges in the work place. Identify Employees and Volunteers to Each Other: Sometimes, especially in larger companies, it can be difficult to remember everyone’s name. By wearing name tags, or other personal identification, newer employees and other team members in the company can easily recognize each other. Name badges also provide accountability to employees as once a name tag is worn, it requires the wearer to accept responsibility for his/her actions. Build Company Recognition: Corporate branding is a rising trend and doesn’t look like it will peak any time soon. By adding a business or organization logo to a name tag, every employee or volunteer will be identified quickly and easily. While name tags and name badges are typically used in only an office or retail setting, inevitably they will be left on when going to lunch or even on the way home. A company’s name and brand will be advertised quickly in the world when employees continually wear their name tags in public. This type of branding can also be beneficial to advertise special promotions, sales or events. Conversation Starters: Name tags are a great way for customers and consumers to start up conversations with employees or volunteers. Name badges let the customer know exactly who they are working with from the first moment they meet your employee. Personal identification provides an easy way for customers to identify these employees or volunteers. If a customer has a question or requires assistance, they will know exactly who to ask for help. 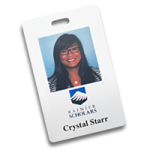 Provides Security In Offices and Retail Settings: When staff, volunteers and visitors are required to wear name badges or name tags, everyone can be quickly identified and acknowledged whether or not they belong where they are. 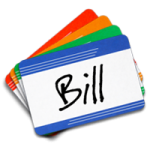 Name tags are particularly valuable in companies and organizations that deal with high tech gadgets, expensive equipment or sensitive information. While personal identification doesn’t seem to be as common as it once was, name tags and name badges will always have a significant place in any work environment. By utilizing name tags into a company’s culture, consumers and customers will be able to relate better to the company’s brand. Name badges eliminate any barrier between the customer and employees, so try adding these to your company today! Great information. Badges do help “break the ice” without having to say a word. Thank you, Devin, for your comment. We appreciate all of our loyal readers. Next time you need a name badge, make sure to check us out at http://www.nametag.com!